Aren't they gorgeous!? 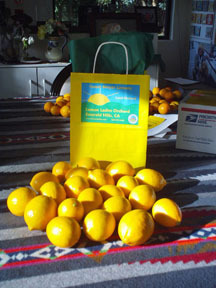 We had the chance to review a bag of beautiful Meyer Lemons thanks to the fine folks over at Lemon Ladies Orchard and we really enjoyed them:) Shipping was super fast and the lemons were so fresh! When we opened our package the wonderful aroma of citrus teased us into cutting a lemon right then and there:) We used our lemons to freshen up glasses of water, add a light squeeze of juice over fish, make a refreshing lemonade and of course in a Lemon Meringue Pie:) These lemons were smooth and juicy and easy to zest...really, some of the nicest lemons I've ever worked with! They were tasty too. Their sweet citrus flavor was enjoyed by every member of the ABCD household...the kiddos were even asking for plain lemons as a snack...woohoo! ABCD Diaries gives Lemon Ladies Orchard an A+! 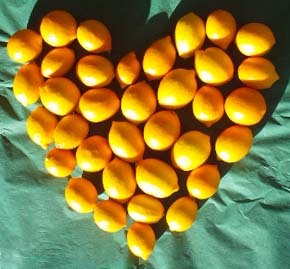 Keep up with the latest news at Lemon Ladies Orchard! These look fantastic! Hope they have a giveaway for these!